Following on from the previous article about The Punter's Revenge, I am reminded of ratings for football games. Mentioned in The Punter's Revenge Rateform is a ratings method borrowing from the chess world's Elo rankings for chess players. 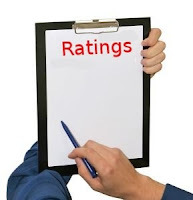 The system was called FRAN (Football Rating Assessment Number) and is continued to this day under the name of Rateform. Rateform works in the following manner. Initially, the ratings system assigns the same number of points to all teams in a particular league division. Over time points are redistributed between the teams, the better teams gain points and the not so good lose points. Over all the average points for each time remains the same. For each match played, the home and away team contribute a fixed proportion of their ratings points. It is generally accepted that the home team contributes slightly more as it has more to lose by not winning and the away team has more to gain from an away win. The winning team takes all the points contributed. However, if the game ends in a draw then the away team gains the difference between the slightly larger amount of points the home team contributed. For the home team, winning is important. Even a draw will result in the lowering of the team's rating. Other ratings systems, based solely on say the number of goals scored in the last few games do not take into account the relative strengths of the teams. Scoring an away goal at Old Trafford is a lot more important than scoring away at the ground of a team less accomplished than Manchester United. Over time Rateform ratings settle down from their initial starting values and become quite representative of the chances of one team beating another. Also the values you assign to the number of points contributed by the home and away teams is optimisable. Generally, it is thought that the home team should contribute 7% of its rating and the away team 5%. But with the ratings you can perform a statistical survey and reoptimise these percentages, if you so wish. We can also have different values depending on whether the game is a local derby, in the winter, dependent on crowd attendances, a vital or not so vital end of season game etc. The list of optimisations is endless. As you can see, we now have ratings that can be tested. For example, if a team has a 200 points advantage or more, we can statistically test how many times such a team wins and by how many goals. We can use these statistics to judge how good the rating system is and if it needs modifying. Our statistics will also give us a win probability that can be matched against odds being offered to determine if there is an edge over the market that is worth betting on.